Newsham Victory won the Standard Security Blyth and Wansbeck Sunday League Eric Anderson Cup with a win over Bedlington Red Lion in the final. David Lillico put Newsham in front before Reece Farrell levelled with a free kick. In the second half Lillico restored Newsham’s lead and they completed the win with a David Thompson penalty. 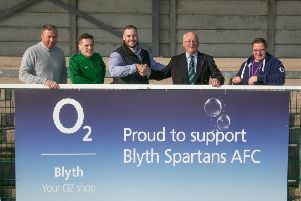 League secretary Frank Scantlebury thanked match sponsors Reay Security and Bedlington Terriers for the use of their facilities before presenting the trophies. The man of the match award went to Craig Frazer of Newsham Victory. In the semi-final of the George Davison Cup, Spring Gardens won an extra-time battle at Marden Residents. Chris Appleby scored the winner after the sides finished 2-2 after 90 minutes, Stephen Ardley and Craig Boyle scoring for Gardens while Shaun Nolan and Adam Burn responded for Residents. Spring Gardens will now meet Burradon and New Fordley in the final on May 8 with a 2.30pm kick-off. Blyth High Street reached their second final of the season with a 5-2 win at Ashington Station Lounge in the JD Marnock Cup semi-final. Damien Stevens scored both goals for Lounge, but on target for High Street were Jason Smart, Anthony Goldie, Brandan Nadeem, Anthony Marshall and Chris Laidlaw. They will now meet Ashington Northern in the final on May 8 with a 10.30 kick-off. In the premier division, Bedlington Social Club won 10-0 at Ashington Town Central, with goals from Joe Moscrop (6), Jamie Chapman, Josh Monaghan, Joe Bolam and Tony Armitage. Burradon and New Fordley look well on their way to regaining their title with a 3-0 win at Blyth Waterloo Pub, with Ian Lee (2) and Lee Waugh the scorers. Red Lion Earsdon and Broomhill North End Trap shared the points with a 1-1 draw. Mitch Renney scored for Lion and Kevin Bell replied for Trap. Division one saw Blyth United Services and Ashington Sporting Club share the points in a 2-2 draw. David Long and an own goal were the markers for Services, while on target for Sporting Club were Anthony Richardson and Adam Mavin. Cramlington Green maintained top spot with a narrow victory by the odd goal in three against Ashington Northern. John Leonard and Michael Jordan scored for Green and Daniel McDonald for Northern.